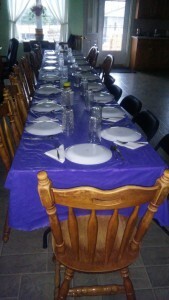 Lovina’s Thanksgiving Day table awaits her guests. We had a nice, enjoyable Thanksgiving Day. We have so many blessings and so much to be thankful for! My sister Emma, Jacob and family, sisters Verena and Susan, and daughter Elizabeth and Timothy spent the day with us. We set the table for all of us. I stuffed two turkeys with dressing. I like to lay strips of bacon on top. Joe’s dad always did this. 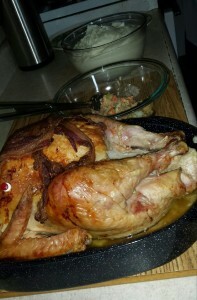 It keeps the turkey moist while baking it, and the flavor of bacon adds an extra taste to the turkey. 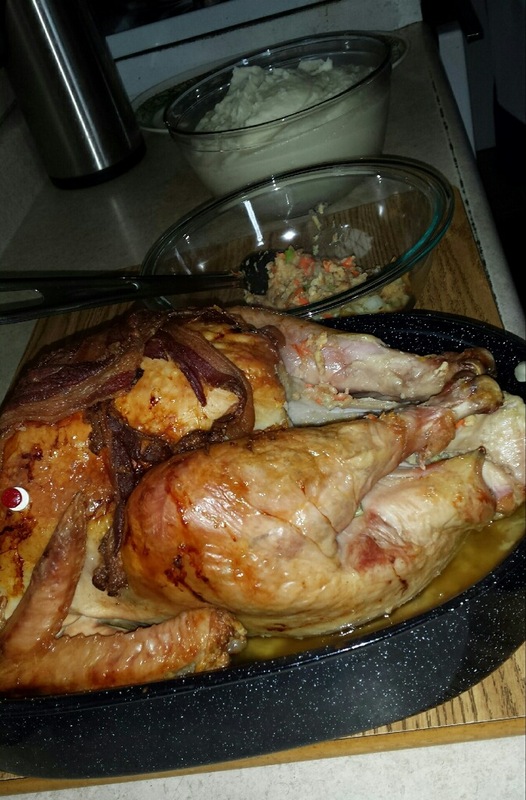 Bacon-draped turkey was the signature dish for the Eicher family Thanksgiving. Also on the menu were mashed potatoes, gravy, corn, macaroni salad, corn chip salad, a variety of sliced cheeses (such as pepper jack, Colby, and Swiss), veggies and dip, homemade bread, butter and strawberry jam, dill pickles, hot peppers, fruit dip (with orange, apple and pineapple slices), pumpkin roll, pumpkin pies, a variety of cookies, and ice cream. We had way too much food, but when everyone brings something, it all adds up! I don’t think many were hungry for dessert. We snacked later in the day. 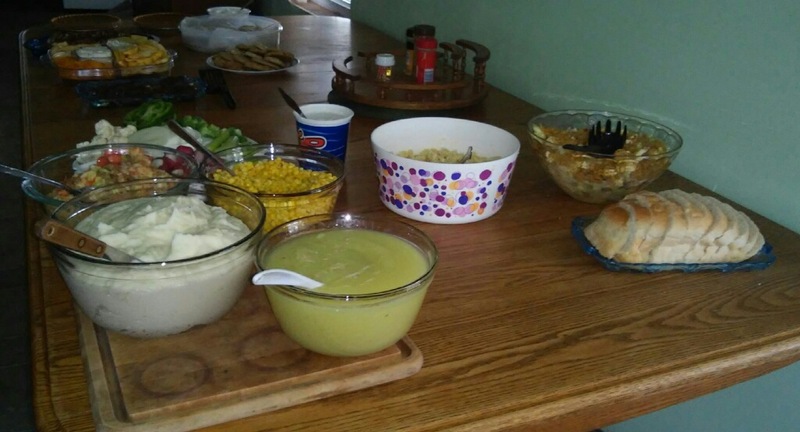 Scrumptious side dishes rounded out the Thanksgiving menu. Games were played, with Connect Four and Aggravation being the main ones. We have a game board that nephew Jacob made, and we like playing with six people in three teams. It can get really exciting—and aggravating as well! Joe and I, Mose and Susan, and Timothy and Elizabeth played this in the evening too. Daughters Verena and Loretta left with friends in the afternoon and had supper with them. Sons Joseph, 13, and Kevin, 10, went home with Timothy and Elizabeth. Joseph wants to go deer hunting with Timothy. Kevin enjoys going to spend time with their dogs, Crystal and Izzy. On Friday Joe and I went to Jacob and Emma’s house. Joe helped with mudding drywall in the new upstairs bedrooms. I took our leftover food from Thanksgiving dinner and helped Emma prepare the meal for the men working there. Timothy and Elizabeth dropped the boys off there on their way to town to go shopping. The girls stayed home and washed clothes and mopped the floors and cleaned up from Thanksgiving Day. Son Benjamin went to work helping Mose at his sawmill. I want to help Emma with painting the walls when she is ready to start on that. Kevin was fitted for new leg braces to help him with his muscular dystrophy. We have seen a lot of improvement with the braces, although Kevin does not look forward to wearing them again. The doctors suggest he keep wearing them, so we will try them again. Yesterday daughters Verena and Loretta and I went to a Tupperware shower for our neighbor girl Ruth, who was married in October. Lunch was served to all of us. From there we traveled a few miles farther to go see what bargains we could find on material at the local Amish store that was having a sale. We found enough material to keep us busy sewing for Christmas gifts. Time is limited between now and Christmas! I’ll share the corn chip salad recipe that daughter Elizabeth brought on Thanksgiving Day. Toss together all salad ingredients except corn chips. 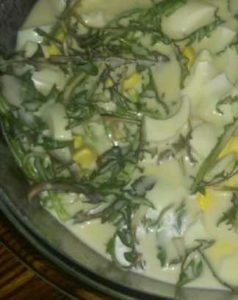 In a separate bowl, mix dressing ingredients and then stir into salad. Add corn chips just before serving.